Scottsdale Kierland home w/Pool, 3 Bdrs, 2 Baths, modern and ready for you! 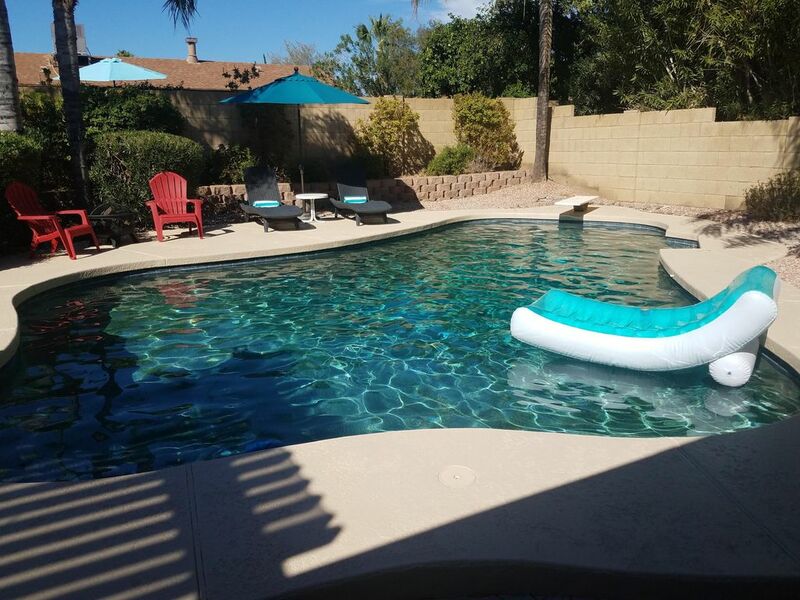 Location is perfect, plus a private pool, great backyard, covered patio, 3 bedrooms, 2 full baths all in this North Scottsdale Kierland neighborhood. This home has been newly setup for Vacation Rentals. Everything is fresh and new. Minutes to anywhere from here. Freeway access 3 minutes, TPC golf 5 minutes, Westin Kierland is 3 minutes, Scottsdale Quarters and Kierland Commons are all only 5 minutes away. Pool heating is available at $300 per week. We even have Bikes in the garage for your use as well. Evening fires poolside with a real wood firepit. We look forward to hosting you and your family. A perfect location and home for two/three couples or an entire family. The yard, back patio, and pool are all very private. No prying eyes. Outstanding new Weber Gas Grill. We want to earn your review. New to VRBO let us host you and group. You will love this home and find everything is all so close from this location. You will want pool heat added at $300 a week any time from Mid-Oct to early May. Make a great Vacation! Relax and Enjoy! Looking forward to hosting you. We have completely updated and refreshed the home in every way for Vacation Rentals. You will love it as we do. Enjoy the heat pool, quiet and private backyard. Always worth paying for the pool to be heated. This North Scottsdale, Kierland area can't be beat. We love this North Scottsdale area and bought this home because of its great location. The house is in a quiet residential neighborhood but still close to hiking trails, excellent restaurants, shopping, golf courses, Spring Training and all major freeway access. There is so much to see and do at the Scottsdale Quarter and Kierland. Feel free to use our bikes to explore the local area. Location – 1 mile to Kierland Commons, 1 mile to Scottsdale Quarter, TPC courses, PHX Open, Barrett Jackson and more. Pool and patio – private, pool with heating available for you. Interior – everything is brand new, from silverware to sheets to furniture. Let us earn your review! TPC is 2 miles and Westin Kierland is 1 Mile. Back Yard Private Pool. Add heat @ $300 a week. Worth it! Great Location and in North Scottsdale, Kierland area. Close to TPS, PHX Open, Barrett Jackson and everything! We will definitely go again. Pool is fabulous. Very private yard and pool. We loved this house. It’ feels like home and the pool was great. Thank you for the review. It was our pleasure to host you and your family. Safe Travels and do come again. Had everything we could ask for. Really great location for restaurants, hiking, and spring training baseball. House is well stocked with linens and towels. Kids loved the pool! Thank you for the review and thank you for staying with us. It was actually our pleasure. Safe Travels and do come again. Place was very clean and in a great location! Owner responded immediately when we had a question. Hope to stay here again! Thank you for the review and the 5 Stars. We enjoyed having you at our home. Yes, please do come again! Very comfortable and well equipped. Nothing the house doesn’t have. Thanks for allowing us to host you. Thanks for the review. Come again! Beautiful home in a great location. Near upscale shops at Kierland. Quiet neighborhood. Private backyard with swimming pool. Easy access to Scottsdale Road and the 101 highway. Favorite place we have stayed at in the Phoenix area. Thank you for the outstanding review. We are so glad you enjoyed the home and your stay. Location, Location, Location this is it! Everything is within a mile in any direction.